Spoiler alert: This wasn’t anywhere near as difficult as last week’s. It’s one of the signs of advancing years that time passes more quickly than it did, and it didn’t seem like a year since Nutmeg’s last Listener. Luckily, a quick check in the Crossword Database showed me that it had only been seven months since her puzzle Aft required us to be artistic with aspects of Sherlock Holmes titles. This week we had a nice grid with mirror symmetry about the vertical axis. Unfortunately, we also had another alphabetical jigsaw, and I’d just finished blogging EV No. 1217, Quantitive Easing by Jaques, over at fifteensquared. I don’t know if I’ve said before, but they aren’t my favourite type of puzzle, but I’ll always accept the challenge. Here, the grid lengths didn’t seem to match up with the clue lengths, but I’m getting accustomed to that being the case. There were two unclued thematic entries in the grid, and they were (fairly) obviously the ones in the outside columns. There were also half a dozen 3-letter entries for which there were, apparently, no clues. Anyway, the first job was make a list of clue numbers 1–42 against the clues and in my notes. Phew! Time for a cup of coffee. Clues 1 ABRIM, 2 ACTED UP and 3 AGAPE were solved without too much trouble. However, there was then a huge gap till the next one I solved — 27 ROSTRA. 29 SCALAR and 30 SCAMPI came next, although who Delilah’s father was (31) or what Olympic sport had only 5 letters (33) eluded me. I solved a few more before the end, and then it was time to fill in the gaps, including all the A–R ones that I was missing. Half an hour later and I had SAWDUST and SENSIBLY plus VENT and YELP, and I jiggled them into the top centre of the grid. ACTED UP then fitted in column 9, and I was up and running… well, walking briskly. Another half hour, and the two unclued entries were ••FU••A•••N and ••G•••N•••S. The first looked like it could be BIFURCATION, the second could be ‘beginnings’ or ‘endings’ or a mixture. BIFURCATION should have helped me a bit, but, in hindsight, the lack of many answers which started with the same letters was a bit of a hindrance. Eventually, SAILING (yes, should’ve got it sooner) enabled RIGHT ANGLES to go in the right column, and then BRUNEI and BRUTES enabled me to see what was going on. 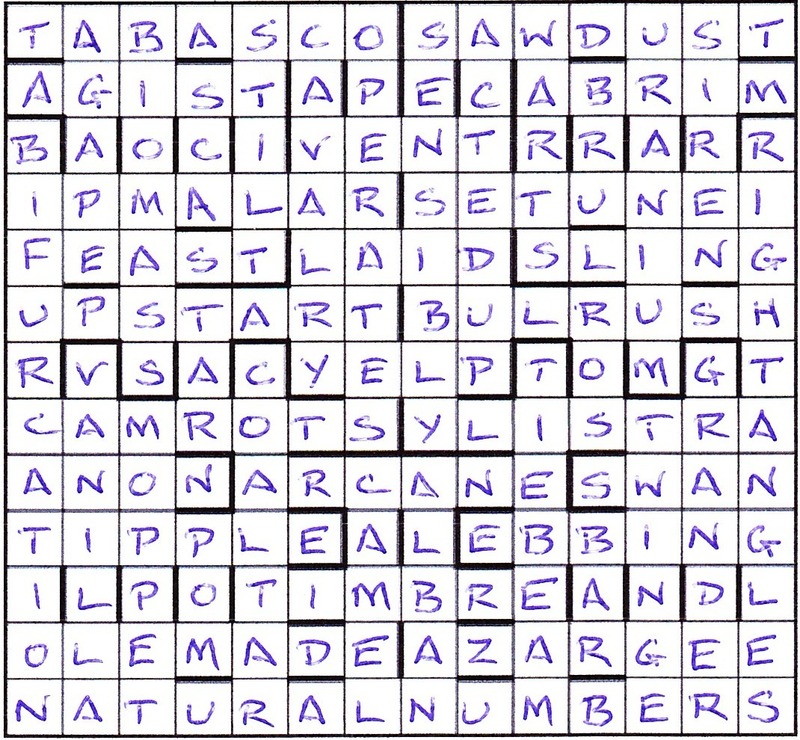 Each of the 3-letter entries provided the start of two 6-letter answers which then forked left and right. Once this fell into place, I managed to polish off the endgame fairly quickly. Not that the whole puzzle was a quick solve. I think it was about three hours. But what an enjoyable three hours, despite my aversion to alphabetical jigsaws. I’m still surprised that this idea for a puzzle hasn’t been done before, but how delightfully Nutmeg implemented it. Many thanks to her for a nicely-crafted puzzle. This entry was posted on 1 April 2016 at 4:00 pm	and is filed under Solving Blogs. You can follow any responses to this entry through the RSS 2.0 feed. You can leave a response, or trackback from your own site.